It wasn’t too long ago that I found the itablet BK01 Bluetooth Thumb Keyboard while strolling through the aisles at my local Microcenter. The BK01 has served me well, but not well enough to keep me from looking for something better. 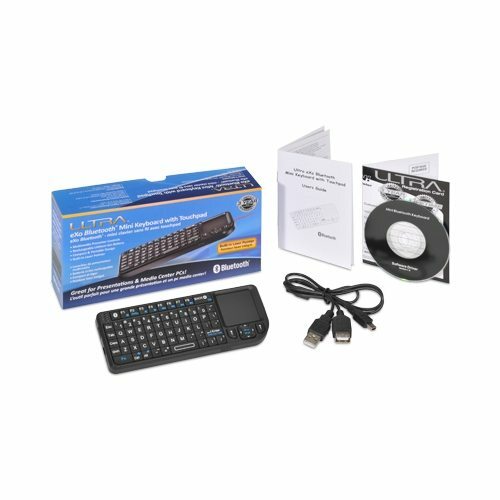 Recently, an online retailer featured the ULTRA eXo Bluetooth Mini Keyboard for an incredible price of $19.99. The question now… is it worth it? 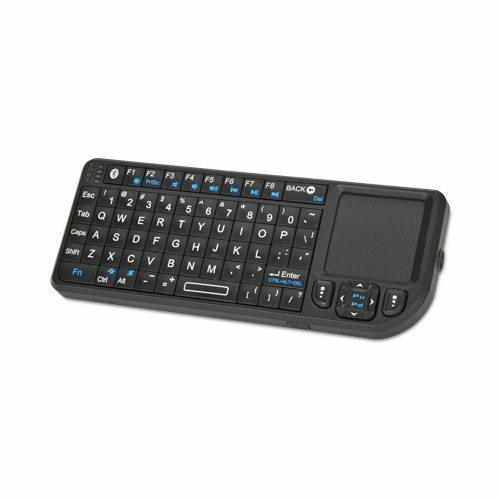 The U12-41310 is an ultra small, ultra-portable, multimedia keyboard that features not only back-lit keys for low light computing, but an integrated touchpad for easy navigation. The U12-41310 measures just 6 inches by 2.4 inches by 5 inches making it just a half-inch longer than your Samsung Galaxy SIII, the keyboard sports a 30ft range, weighs in at just .22lbs, it is rechargeable, has an integrated laser pointer for presentations and kittens, and to top all that off… it comes with its own Bluetooth adapter. Each key on the face of the keyboard is tightly packed next to its neighbor, but fret not my fat fingered friend, typing is easy. The keys are tightly packed but are still big enough to hit just one key at a time. The top row of keys features your typical F1-8 function buttons, but also double as your multimedia keys. If you hit the Fn key and the F1 key at the same time, the keyboard will illuminate. Some of the other neat additions include the Backspace key doubles as your Delete key, the Enter button doubles as a Ctrl-Alt-Del key, and F2’s alternate personality is a PrintScreen button. Also on the face of the keyboard is the integrated touchpad. The touchpad supports double tap functionality, but more importantly, there are also left and right mouse buttons just below it. Centered in between the left and right mouse buttons is your up, down, left, and right arrow buttons for better navigation through HTPC applications like WMC or XBMC. The bottom of the U12-41310 homes your laser button, the top sports a hidden Bluetooth USB adapter, the right is the laser, and the left has your on/off switch and the USB port for charging. Although Ultra lists the mini keyboard as having a range of 30 feet, in testing we were unable to reach that limit. In our environment, we were able to maintain a usable connection only within 15 feet. Within the 15 ft distance, all input was instant, keystrokes were natural, and mousing around was a pleasant experience. Moving outside of that range left us with mouse moments that were lagging and key presses that were incredibly delayed. 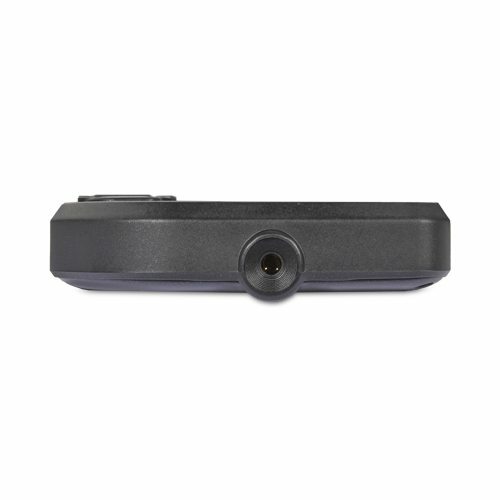 We were able to obtain more favorable results using another Bluetooth adapter, extending the range a few feet. The Ultra eXo Mini Keyboard is powered by a rechargeable Lithium-ion battery and although battery life is good, it’s not great. We were able to go a couple of weeks without charging given regular use (HTPC for cable television). I would rather have the mini keyboard use AAA batteries instead. If you are fortunate to find one of these on sale, I would say that you should not hesitate to pick one up. The U12-41310 puts everything that you need into one small and functional package. There are some limitations with this device, like the range of 15 feet, that may make it easier to pass up at higher prices, but a better Bluetooth adapter may be able to solve that problem for you. The illuminated keyboard and included touchpad makes this a must for those that want to ditch the full size keyboard and mouse resting on your ottoman.